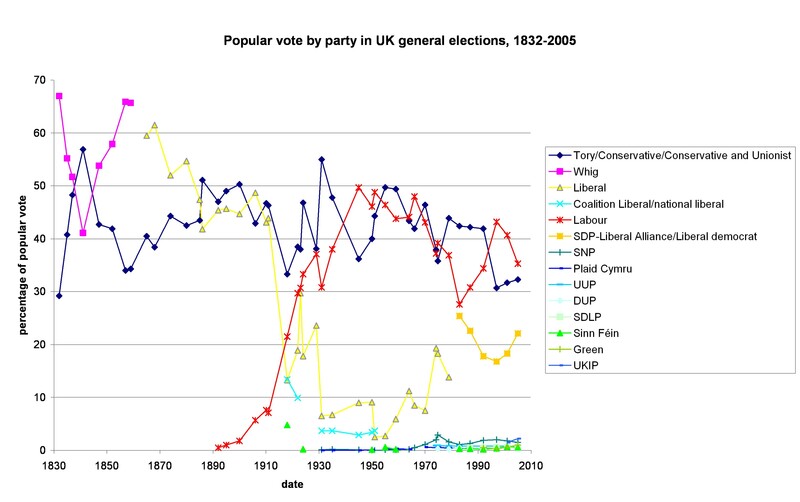 Jon Cruddas' Compass speech included a graph showing the popular vote since 1832. A reinterpretation of the data shows Britain's 60-year progressive consensus. “Labour has faced two periods of real crisis and now stands on the verge of a third. The first followed the crash of 1929, and the collapse of the second Labour government as MacDonald, Thomas and Snowden entered the National Government. “The second came with Labour’s loss of power in 1979, the Thatcherite ascendancy and our threatened eclipse by a new third party in the early 1980s. 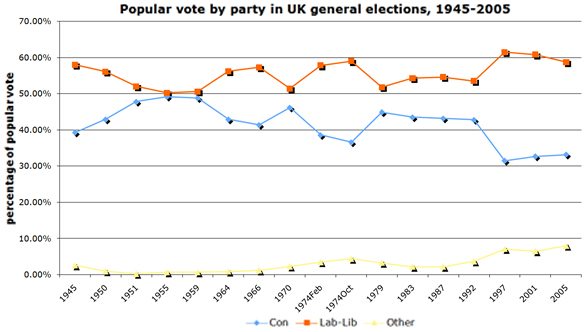 Polly Toynbee, in response, noted that the graph showed that the Conservative Party had never, in the post-war era, had a majority of voters. The graph below, produced by Left Foot Forward, shows the Conservative vote plotted against the combined Labour and Liberal/SDP-Liberal Alliance/Liberal Democrat vote in every election since 1945. James Purnell, Polly Toynbee, Neal Lawson and Jon Cruddas were united last night in calling for a referendum on proportional representation on election day. With the data in front of you, it is easy to see why. This is all well and good but will only make a difference if there is real proportional representation, as the Tories won the majority over all parties (except for 1974 and 2010) of seats despite not winning a majority of votes.